Imported from Germany, Ester is a 100% DDR female with excellent DDR head and dark pigment that is known to the DDR Dogs. A large and very well proportioned female with correct "V" Rated working structure, she has excellent substance of stature with substantial bone and lovely conformation. Her expression, character and head type is superb and is typical of what we like to see from the great DDR dogs, particularly in the females. Ester is watchful of her surroundings and alerts boldly to strangers entering the premises. She is a confident, agreeable female, and her bite work is fast, full, and hard. A proven mother, she has produced one litter of 10 pups before arriving to our kennel. 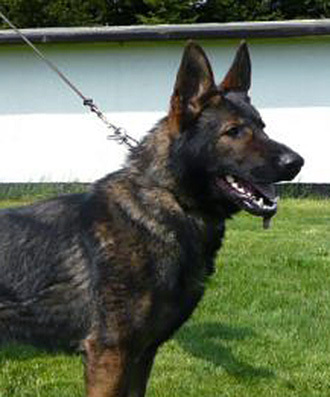 Ester's coat color is a rich, dark black sable with excellent pigmentation. With an outgoing and free temperament, she is a strong female with a sure and courageous nature. 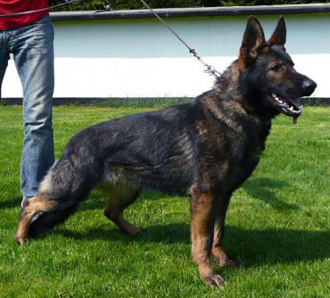 Ester demonstrates very good tracking ability and normal protection skills for a good DDR working female. 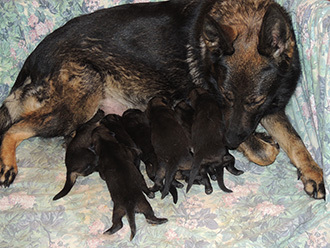 A kind, nuturing mother, she takes excellent care of her babies, which we believe to be a very important aspect in what the pups turn out to be as adults. Ester will be an excellent choice for producing pups which will be suitable for SAR, Family protection, Schutzhund, and therapy dogs.